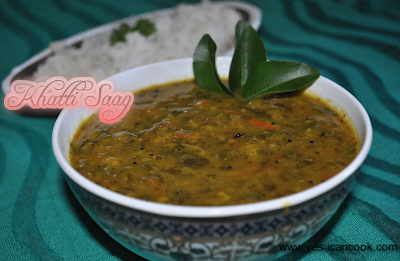 Khatti Saag is an amazingly tasty accompaniment for steamed rice. 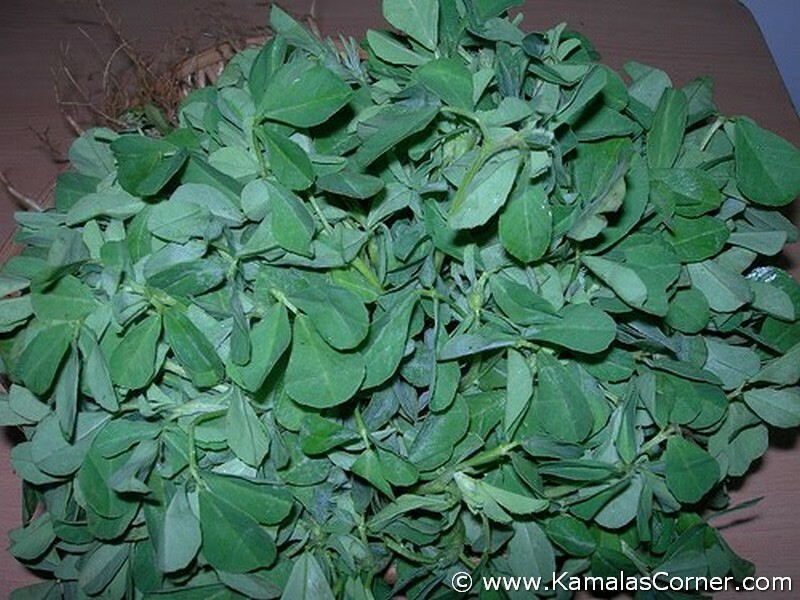 Green leaves are cooked along with lentils to prepare saag. 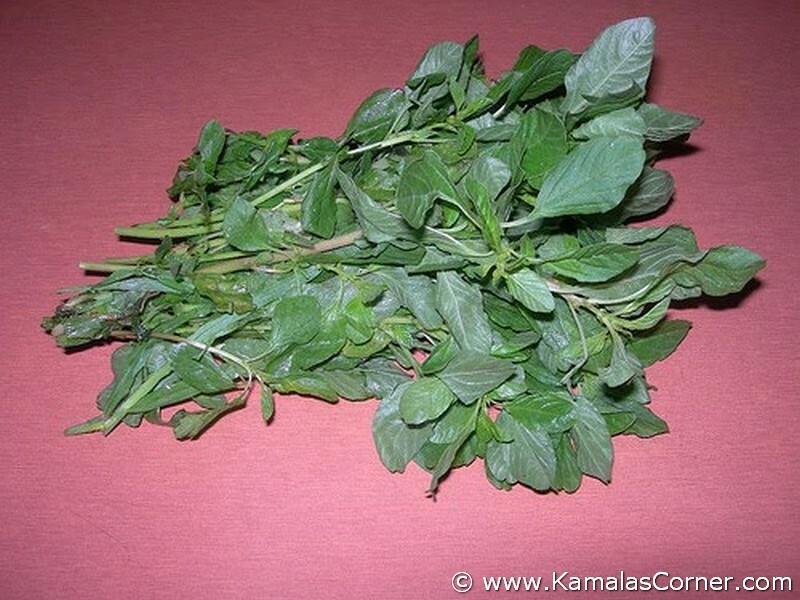 Today I made saag with amaranth leaves but saag can also be prepared using Purslane. This is my mother's recipe and I have been enjoying this since childhood. Saag can be served with Indian bread of any type and also with dosa. 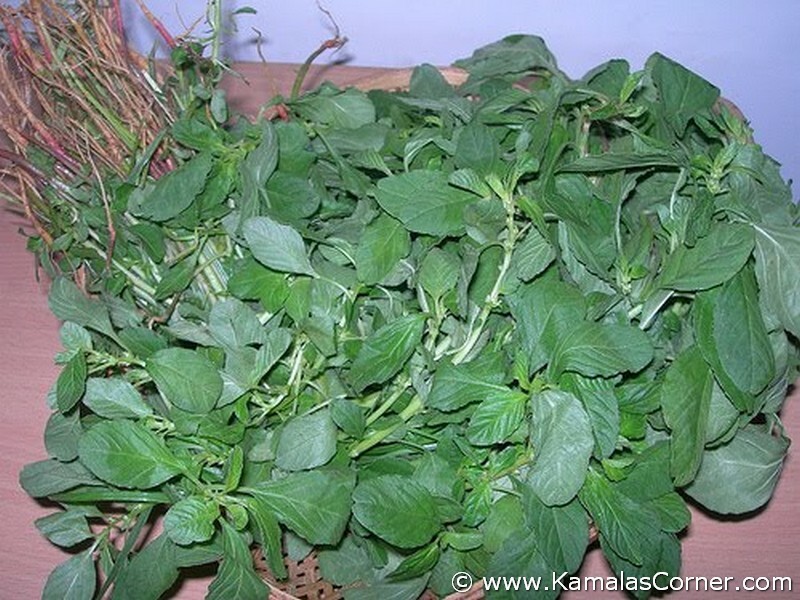 In Urdu (spoken in my family) Tropical Amaranth leaves are called chudi ki bhaaji (siru keerai in tamil) and Amaranth Tristis leaves are called maat ki bhaaji (arai keerai in tamil). Purslane are called khulfa (paruppu keerai in tamil). Click on the names to view image. Thanks to www.kamalascorner.com for images of the greens. 1. Wash and Pluck the leaves of the amaranth and discard the stalk and stem. 2. Add the amaranth leaves to a tall vessel with water. Swirl with your hand a few times and leave it for 10 minutes. All the dirt and mud will settle at the bottom. You can remove leaves from top. This can also be repeated a few times if required. 3. Wash all 3 daals and add it to a pressure cooker. 4. Add coarsely chopped onion, coarsely chopped tomato, green chillies, turmeric powder and 4 cloves of garlic. 5. If using raw mango, wash and peel it, cut into small pieces, discard the seed and add the pieces to the pressure cooker. 6. Add the cleaned amaranth leaves. 7. Add 1 1/2 cups of water and pressure cook for 8 whistles. 8. Let the pressure release on its own. 9. If using tamarind, wash and soak it in water. Extract juice. 10. Coarsely gring the cooked lentils and amaranth leaves. Do not grind it into a paste. I use hand mixer. 11. Add the tamarind extract and mix well. 12. Add water as required to adjust the consistency. It should be of a thick soup or a gravy consistency. 13. Add salt as per taste and mix well. 14. In a cooking vessel heat oil. 15. Add dried red chillies. 16. Add 3 crushed garlic cloves. 17. Add mustard seeds and let them splutter. 19. When garlic turns golden in colour add red chilli powder. Immediately add 2 tablespoons of the ground saag and mix. Then pour all the saag and mix well. 20. Cover and let it cook for 5 minutes.